Our one door locker from Elite provides a large individual locker for hanging full length garments and an additional hat shelf at the top. Manufactured in the UK to the highest specification. 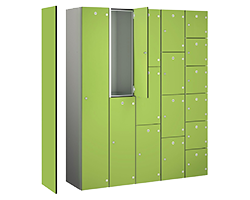 These lockers are particularly popular in schools, leisure centres and workplaces. A choice of lock options is available. Each Elite Locker has been coated with EliteGuard, an anti-bacterial coating. Elite Lockers contain Abbeysteel™ - sustainably sourced steel, a unique raw material that can show a significantly reduced carbon footprint of the products that contain it and the businesses that use these products.